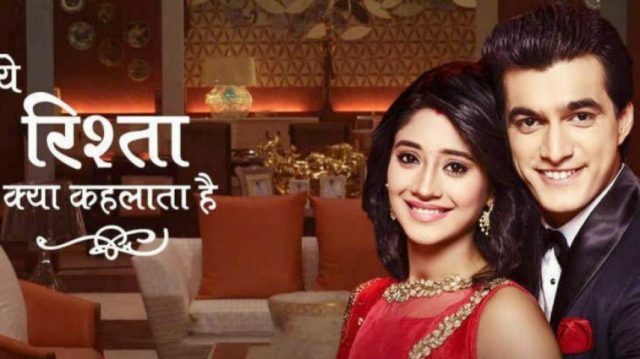 "Yeh Rishta kya kehlata hai"written Episode on 20th July 2018. " Naira and Kartik meets same temple "
The episode “Yeh Rishta kya kehlata hai starts with Naira and Kartik meets at the Same temple. Both “praying to god” Naira Hold the bell .both together see each other. Suddenly A passes by Lady. Naira falls Kartik side. Naira sees forehead gets in her “maang” Kartik saying is Naira you left Mumbai” what happened ” she says I coming back with Naitik. She says it doesn’t matter. Naira leaves it. A lady passes by and she sprinkles water. Water falls on Naira forehead. Naira walk and she is crying. She stands for temple outside. 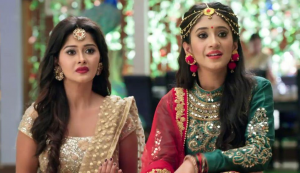 Devyaani comes she asks” why is tilak on your forehead… Suddenly Naira thinks Kartik she says I have managed everything, “I hope do not against this ” because I have so much difficulty. Naira says if “my heart keeps breaking “. Suwarna said that if its bad and we all hurt me. Suwarna says the family that they shouldn’t accept the god alliance. The families are shocked to see each other. Mansi and Anmol become very upset. Because their family didn’t support them. Both think my plans failed. Goenkas and Singhanias come to face to face from temple. This is Mansi and Anmol plan both Family is together and each other. Naira and Kartik stop and solve the fight. Kartik says stop it. He stops Suwarna and Surekha. He says please “finished any argument ” Kartik and Naira discuss the fight. Both Feels that are responsible for the argument. Both calls from their respective lawyers, regarding the. Div office. Naira and Kartik call lawyer. Naira says lawyer you can meet them in evening. He says you can meet. Lawyer says yes. Kartik and Naira Go to meets lawyer. Both calls from their respective lawyers. Manish saying to Suwarna to forget it. Kartik umbrella flies in the rain. Kartik and Naira Meets and both hold the same umbrella. Both go the meets lawyer office.